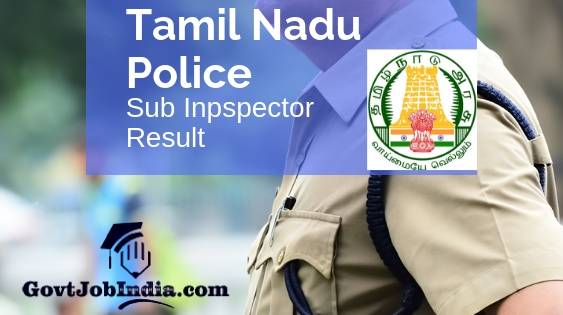 TNUSRB SI Taluk Result 2019-20- The Tamil Nadu Uniformed Services Recruitment Board is all set to release the TNUSRB SI Taluk Result for the year 2019 for the recruitment exam conducted for the appointment of 969 Sub Inspectors. If you were one of those who attempted the exam and is waiting for the TN SI Result 2019-20, you will find all the details of this here on this page. Furthermore, this page also contains details of the Tamil Nadu Sub Inspector Cut Off and TNUSRB SI Merit List 2019-20. These will give you a general insight into the expected result. Also note that we have given in depth about the next stage of the recruitment process, which will be the Viva Voce. In addition to this, we have given a direct link on the official website (www.tnusrbonline.org) where the result will be published. But since the TNUSRB SI Recruitment Result has not come out yet, this link remains inactive. Its will be up and running as soon as the Tamil Nadu Uniformed Services Recruitment Board publishes the TNUSRB Police SI Result. The Tamil Nadu Sub Inspector Vacancy was a great opportunity for all candidates across the state to secure a govt job in the police sector of the country. Now, that the test is over, candidates can expect the TN SI Result anytime now. So, now that you have gone through the components of this article, let us move onto the elaborate content. How to Download TNUSRB SI Taluk Results 2019 Online? Start this process by going to the official website of the Tamil Nadu Uniformed Services Recruitment Board (TNUSRB) which is www.tnusrbonline.org. On the official website, find the recruitment section and the TNUSRB SI taluk Result will be there as a newsflash. Click on it and you will be taken to a new window. Alternatively, you can click on the link given below which will take you to the window mentioned above directly. Enter your registration details. Along with this, fill your password and enter your details. The cut off marks are the minimum marks which a candidate needs to score in order to secure a place in the next stage of the recruitment process. This will be dependent on various factors and will also differ according to different categories (reservations) decided by the authorities. But to give you a rough estimate of how the cut-offs will be for this year, we have given the previous year cut offs. But what is the importance of the cut off marks? Those contenders who score above the cut off marks will be called for the next stage of the recruitment. This means that they will feature in the TNUSRB SI Merit List. Therefore, all the candidates whose names appear in the TN Sub Inspector Merit List will be called for the Viva Voce. What after the written exam? The next stage of the recruitment selection process is the Viva Voce. In this stage, all the selected candidates will be called for a one on one meeting with the representatives of the board. Their knowledge will be tested and candidates will be graded upon this. This will be crucial to getting selected for the recruitment because without appearing for the interview, candidates will not be filtered to the next stage of the recruitment. We will be constantly updating our page with any new information released by the board, so we would advise you to stay connected with us on this page. Did you have trouble accessing your TN SI Result 2019-20? If yes, you can leave in the comments section exactly where you are finding it difficult. Our team will get back to you as soon as possible. Additionally, we would love to hear about your score. Did you qualify for the TNUSRB SI recruitment? How was your score? Let us know in the comments below and we can form a community. Also, make sure that you share this article with a lot of people because there are certainly a huge number of aspirants who wrote the exam. In conclusion, do not forget to subscribe to our website @ GovtJobIndia.com for updates regarding any govt notification across the country.